Texas: It's not simply a state, it's a state of mind. Those who live here get it. Those who don't, never will. Texas is hot. It's flat. It's dry. We don't handle things like "cold" and "rain" very well. We love Mexican food more than is strictly rational. And when speaking of football, we use reverential tones. 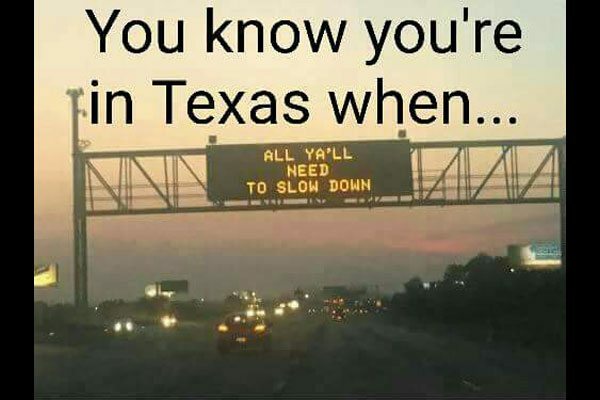 If you're a Texan, you'll understand these 15 hilarious memes about Texas. If you're not, move out here and then you'll get it too. 15. Texans have a unique way to deal with creepy crawlies. 14. So, who do we both know? 13. There was never a truer sign. 11. Fried Coca-Cola, you say? 10. The University of Texas slogan is different on Sixth. 7. May God bless our brothers and sisters in the gray zone. 6. It's a better use of salt. 5. Trust us, it's worse than dogs. 4. Just a small serving. 3. Say goodbye to your skin. 2. What is this "winter" you speak of? 1. That means everyone on the road.